Welcome to another steampunk feature week! Velvet at vvb32reads (the same blogger who brought us steamPINK) is hosting SteamBoyz, an event that features young adult books with teenage boy protagonists. It runs from July 9-17, and will feature giveaways, art, reviews and more. Be sure to check to check it out. I’m going to take part and offer a giveaway here at my blog as well. Please include a method of contact. Giveaway is open internationally. Comments will close on July 17 at 11:59pm EST, and I will notify the randomly selected winners via email. SOOO, the essential accessory would be a sweet hat. of course, the hat would have some special function other than keeping your head warm/ dry/ etc. like, mine would also have a camera/ video recording inside, and it would also hold essentials such as chapstick, chewing gum, and little dissolvable poison pills. i'm just saying. Nice giveaway. I am dying to read Leviathan!! And, I think that the essential steampunk accessory to have is a decent pair of goggles. You know, to keep the steam out of your eyes! And, there's nothing more retro/future than goggles. I'm going with a fob watch. What steampunk look would be complete without a fob? Ah I would have loved to say goggles but Mrs. DeRaps beat me to it! :) But another essential accessory would have to be gloves. Nice leather gloves. I would have super precise gold plated binoculars...good for spotting things while in blimps and hot air balloons. I still say it's a steampowered tank! Geat for destroying those pesky steasmpunk zombies! My essential accessory would be a shotgun. Nothing better to keep the bad guys at bay! Have not read this genre as yet but would like to give it a go! Thanks for opening it to all! 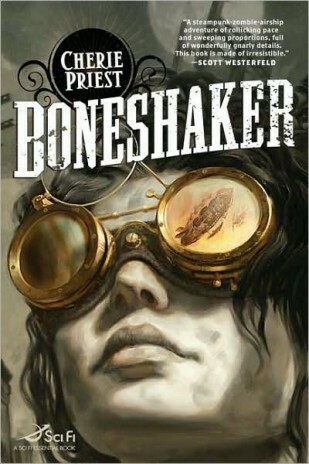 I never read a steampunk books yet. But I've been meaning to read Cail Carriger Soulless series. I think the essential of the steampunk will be the fancy umbrella.it's must to fancy steamboyz! LOL. Celia, have I told you lately that you're awesome? Well, you are, and contests as cool as this one are a good example why. I'm throwing my name in the hat for this one. There are 2 essential accessories: goggles (for riding at high speeds on your dirigible/air ship) & a nice bronze pocket watch so you know how soon you'll get to your next destination. The most essential steampunk accessory is a good pair of goggles. They are perfect for keeping the wind out of your eyes while flying your airship, and if you get the fancy kind with multiple lenses (2-3 per eye) then they are great for examining gears and machinework. Most definitely could not leave the house without my Steampunk Watch Gagdet, it was the one in my post yesterday! I wuold like one of those steampunk walking sticks that doubles as a sword or gun. how fun!! I would say a watch. that was my first thought. Love the other answers though. A vest! A nifty, all purpose vest; either one that says a fashion statement, one that is useful for your job (like if you're an engineer and it holds all your tools) or one to pin your fob watch to! Ah ! The essential accessory. Yes those mentioned are all good-to-haves but bearing in mind the steampunk world, I think that a folding telescope is a real essential. After all we have to study the new machinery we come across and examine the villians, so mine is a powerful folding brass telescope. Hm, I always remember Hester's cool trenchcoat from Mortal Engines so I'd have to say that is the essential steampunk accessory. I'd love to win these! Thanks for making it international. My essential steampunk accessory would be a specialyl engineered parasol: beside the fact that it can be used bith as a parasol and an umbrella, it would be great to hide behind it and peek out when doing some invcestigation, there would be a small telescope at the top with which I could spy as well as a small dagger hidden in its handle. Oh and I forgot the most important part: it would be an invisibility parasol: if I were under it, or just touching it, my whole body would be invisible. I think the essential steampunk accessory (at least for a girl) is a parasol with some kind of deadly weapon built into it! What could be cooler, right? Definitely some good running shoes - maybe even some with some enhancements to make you run faster! You never know how much running you're going to have to do from sneaky steampunk villains. It's always a good plan to have good shoes in these circumstances. A specially made steampunk purse that can hold many gadgets without increasing in size. Since watch, goggles, and vest have already been taken, I would hve to go with a journal. Now good denzien of the steampunk world should be without a book to record all the things they dream up to build and all the things they see and hear. Now preferbly there would be some strange steam powered locking mechanism that you need a special key to open it with. Maybe even a new chemical compound for ink that disguises the words to the point that only the writer would be able to read it. I always picture steampunk heroes wearing monocles, so my ideal accessory would be a monocle that doubles as a Chinese throwing star! This is a common answer, but I'm going to have to go with goggles! I'm going with a pocket watch!! Oh and a cool sidekick of course! I think the essential steampunk accessory is none other than chatelaine, which is a set of short chains on a belt worn by women and men for carrying keys, thimble and/or sewing kit, etc. I'd say a luxurious fan with feathers, ruffles and beads. What is the essential steampunk accessory? Special high functioning gogles. They do not fog up. They have a gps, phone with built in speakers, camera that also sees in the dark and thru steam/fog. They also have a laser button that stops people in their tracks. They cannot move until you laser them back. Yap! That's it. Thanks for the giveaway. Wish I could subscribe by email...wink...wink. I want to say goggles, but EVERYBODY is saying goggles. Or hats, because I love hats. Because, come on, how hot is that? I'm so new to steampunk so I don't know how qualified I am to know the essentials but the first thought that came to me was the wind-up pocket watch. I'll be different and go with the steampunk inspired and fashionable steampunk cuff as my essential accessory. I saw this on etsy one day. Thought it was a unique and interesting item. Rockers wear cuffs all the time, why not a steampunk one! Thanks. The essential steampunk accessory are goggles, of course! Like these ones.